This is the title of a cookbook I just received for my birthday... of course, it was a belated birthday gift - ha you thought i just revealed my birthday date - no - i didn't. 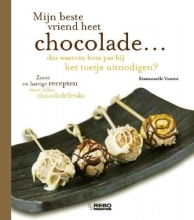 anyhoo, My best friend named chocolate - is an interesting little book - not just desserts - it also includes appetizers, main course entrees, and then more desserts. For example, one such recipe is titled Lolly's from geese liver with chocolate. (This book is in Dutch so I translate it the best I can). The food looks fantastic, but the title - can't say it's very interesting. I don't think I ever want to eat liver of any animal. I was brought up that way to just say no thanks. - the Lolly's from geese liver. "Terrine van chocolade en Kinder Bueno" - Kinder Bueno is a German candy bar. It's like cream filled little chocolate bars - for the kids. yum. "Perencrumble met Toblerone" - Pear crumble with Toblerone - I think I'll use the white chocolate Toblerone for this one. "Chocoladeslakken" - um, looks like pinwheel cookies - easy to make - only uses pie dough, sugar, egg yolk and Nutella! A cookbook all about chocolate - what a way to being the new year!